Love the capture of the dog. Have a wonderful weekend. Coco is a cutie! Love the flowers! Hello, Your Coco is so cute. Great pose and photo. I love the beautiful flowers, lovely mosaic. Great shadow shots. Thank you for linking up and sharing your post. Happy Saturday, enjoy your weekend! PS, thank also for the comment on my post. Nice assortment of photos. Great B&W's...love the dog! Great photos but Coco is my favorite! I think Coco wins the prize today - what a sweetie she is! 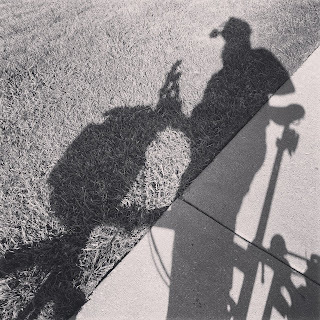 I wonder if the motorcycle rider is as shadowy as his/her ride?